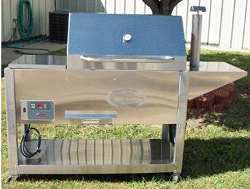 Fast Eddy pellet grills and smokers are marketed by Cookshack and designed by Ed "Fast Eddy" Maurin who is famous on the BBQ circuit and winner of many, many cooking competitions. Having made his own smokers for years and built them for fellow BBQ competitors, Ed Maurin teamed up with Cookshack in 2003 to manufacture his designs on a commercial basis. Apparently he bought a Traeger one time and decided it needed improving. The PG500 pellet grill's body is made from stainless steel, and has a cast iron cooking grate on the flame side. The oven side and the top rack have nickel plated grills. Ignition is automatic, and the time taken to reach 400 degrees is twenty minutes. Maximum heat is a bit over 600 degrees. The cooking area is not insulated. There are some similarities with the Englander grill that Ed Maurin developed in conjunction with Englands Stove Works. The use of doors instead of a lift up top helps to reduce heat loss when checking your food. A little slide at the side is designed to allow insertion of a meat probe thermometer. The ash pan and warming drawer are easily accessible from the front. Cooking area 784 sq. ins. Direct (over the flame) 10" by 18"
Top rack 10" by 28"
Dimensions H 54" W 56" D 25", ( another sixteen and a half inches when the doors are open ). 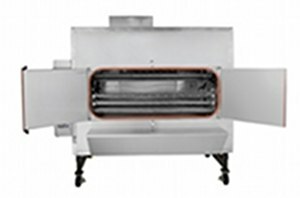 The PG1000 pellet grill's body is manufactured entirely from stainless steel, and has a cast iron cooking grate on the barbecue side. The indirect cooking side and the top rack have nickel plated grills. Ignition is automatic, and the time taken to reach 400 degrees is only eight minutes. Maximum heat is a bit over 600 degrees. The cooking area is insulated to maintain even temperatures and reduce fuel usage. Cooking area 820 sq. ins. Heat output 170 to 650 degrees indirect, 800 degrees over the flame. Dimensions H 51.5" W 67.75" D 24", ( another five and a half inches of clearance is needed for opening the lid ). 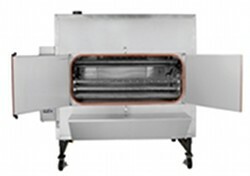 Built from heavy gauge insulated stainless steel, all Fast Eddy pellet smokers have a fast heat recovery time after the door has been opened, (within fifteen minutes). 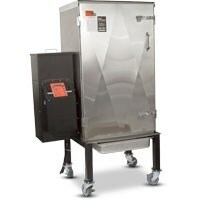 These are serious cabinet style smokers designed for BBQ competition and professional catering. Once the correct temperature has been reached, they automatically drop back to a 'holding' temperature. Operation is fully automatic, leaving just food handling and occasionally topping up the pellet hopper for the operator to do. 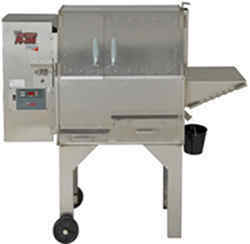 All except the FEC100 have a rotisserie and are capable of optional trailer mounting. NSF approved, ETL listed, USDA approved. Cooking Area 11 sq. ft. Shelf Sizes Four nickel plated shelves, 23" by 17"
Construction Rigid steel tube frame, insulated double wall 20g. stainless steel on exterior. Heat 36,000 btu./hr, automatic ignition, fan circulated air. digital temperature control, temperature probe optional. Electrical 5 amps, 120 volts. Size H 63", W 44.5", D 24.7"
Cooking Area 37 sq. ft. Shelf Sizes 15 nickel-plated shelf/grills, 12" by 30"
Five rotating arms, with 3 - 12" by 30" shelves per arm. 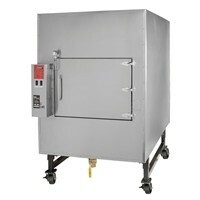 Heat 36,000 btu./hr, automatic ignition, fan circulated air. digital temperature control. Size H 80.5", W 49.25", D 69.75". The FEC300 comes with five rotating arms, with 3 - 12" by 30" shelves per arm. Cooking Area 52 sq. ft.
15 nickel-plated shelves/grills, 11.75" by 41.75"
Five rotating arms, with 3 - 11.75" by 41.75' shelves per arm. Size H 78.5", W 66", D 82.6". The FEC500SS comes standard with 5 rotating arms, with 3 - 11.75" by 41.75" shelves per arm. Cooking Area 75 sq. ft.
Fifteen nickel-plated steel shelves/grills, 12" by 60"
Five rotating arms, with 3 - 12" x 60" shelves per arm. Size H 78.5", W 84.75", D 86.6". The FEC750 comes with 5 rotating arms, with 3 - 12" x 60" shelves per arm.